Every month, we share a snapshot of Shakespeare in performance around America. This month, we check in with our theater partners at African-American Shakespeare Company, American Players Theatre, Arkansas Shakespeare Theatre, Atlanta Shakespeare Company, Chesapeake Shakespeare Company, Colorado Shakespeare Festival, Door Shakespeare, Gamut Theatre, Hudson Valley Shakespeare Festival, Idaho Shakespeare Festival, Illinois Shakespeare Festival, Livermore Shakespeare Festival, Nebraska Shakespeare, Oregon Shakespeare Festival, Shakespeare Dallas, Shakespeare Theatre of New Jersey, The Old Globe, Theatre for a New Audience, Utah Shakespeare Festival, and Will Geer’s Theatricum Botanicum. 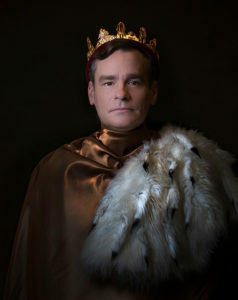 Robert Sean Leonard appears in the title role of King Richard II. Photo by Jim Cox. Robert Sean Leonard (perhaps best known for his role as Dr. James Wilson on the TV show House) stars as the title character in King Richard II (Jun 11 – Jul 15) at The Old Globe in San Diego. The director, Erica Schmidt, says she first gave Leonard the script for Richard II 16 years ago, when he was starring in The Invention of Love on Broadway, in the hope that he would one day take the role. A perennial summer Shakespeare favorite, A Midsummer Night’s Dream is onstage this month at five of our theater partners across the country: American Players Theatre (June – October), Illinois Shakespeare Festival (Jun 28 – Aug 11), Livermore Shakespeare Festival (Jun 29 – Jul 16), Shakespeare Theatre of New Jersey (Jun 14 – Jul 30), and Will Geer’s Theatricum Botanicum (Jun 4 – Sep 4). Another favorite: The Merry Wives of Windsor. Catch productions at Nebraska Shakespeare (Jun 29 – Jul 9), Oregon Shakespeare Festival (Jun 6 – Oct 13), and Shakespeare Dallas (Jun 14 – Jul 21). Nebraska’s Merry Wives runs in rep with King Lear (Jun 22 – Jul 8). Looking for a female Hamlet? Go to Colorado Shakespeare Festival (Jul 9 – Aug 13), with Lenne Kingaman as the lead, or Idaho Shakespeare Festival (Jun 2-25), with Laura Welsh Berg and Jonathan Dyrud alternating in the title role. Shelly Gaza (Kate) and Scott Coopwood (Petruchio) in The Taming of the Shrew at Colorado Shakespeare Festival, 2017. Photo by Jennifer Koskinen. CSF kicks off its 60th season with a zany comedy set in swinging 1940s New York City. Enter Kate, a plucky pilot who’s just returned from the fray of World War II, and her stubborn match, Petruchio. On the vibrant streets of Little Italy, the two duke it out in a battle of wits, dance the night away and discover, against all odds, a mutual respect that’s almost like being in love. Two theater partners are performing The Winter’s Tale in June. Read more about the Shakespeare Festival St. Louis production (Jun 2 – 25) and the African-American Shakespeare Company production (Jun 10 – 18) in our blog post about The Winter’s Tale. Hudson Valley Shakespeare Festival is staging Lauren Gunderson’s new play about Shakespeare’s First Folio, The Book of Will (Jun 9 – Jul 28), and Twelfth Night (Jun 8 – Aug 27). Twelfth Night is also being performed by Door Shakespeare in Wisconsin (Jun 29 – Aug 18). Chesapeake Shakespeare Company’s The Tempest, featuring Nathan Thomas as Prospero and Michaela Farrell as Miranda. Photo by Robert Neal Marshall. Tara Herweg as Lady Macbeth in Gamut Theater Group’s Macbeth, 2017. photo by Kelly Ann Schuler. Gamut Theatre Group’s Harrisburg Shakespeare Company is staging Macbeth (Jun 2 – 17) for the 24th Annual Free Shakespeare in the Park held at Reservoir Park in Harrisburg. Atlanta Shakespeare Company at the Shakespeare Tavern playhouse is staging Richard III (Jun 17 – Jul 2). Theatre for a New Audience in New York is performing Measure for Measure (Jun 17 – Jul 16), directed by Simon Godwin, associate director at London’s National Theatre. Chesapeake Shakespeare Company is celebrating its 15th summer outdoors at the Patapsco Female Institute Historic Park, its original home. Its first production there was Romeo and Juliet in 2003, and this summer’s production is The Tempest (Jun 16 – Jul 23). Will Geer’s Theatricum Botanicum is staging The Merchant of Venice (Jun 3 – Oct 1). Utah Shakespeare Festival opens As You Like It and Shakespeare in Love at the end of this month, with Romeo and Juliet just around the corner in July. This list is fantastic and wanted to note that Shakespeare in Delaware Park, Inc. (SDP) in Buffalo, NY is producing an all-female cast of The Merry Wives of Windsor from June 22-July 16 and Macbeth (traditional men and women casting) from 27-August 20. Performances are Tuesday through Sunday at 7:30pm and SDP is a FREE festival!